I love a good tray, especially a pretty one, and have several all over my apartment. This White and Wood Decorative Tray is a particular favorite of mine because it fits so many décor styles and can have tons of different functions. I use it to display my perfumes on my dresser in my bedroom, to hold coasters, candles, and knick knacks on my coffee table, and even to serve breakfast in bed on the weekends. Because this tray is so affordable, I don’t feel guilty at all for having multiple all over my home. Currently you can pick up your own for only $19.99. With a Prime membership, you are guaranteed delivery in two days. This product is also an Amazon’s Choice, meaning that actual Amazon customers have rated it highly. 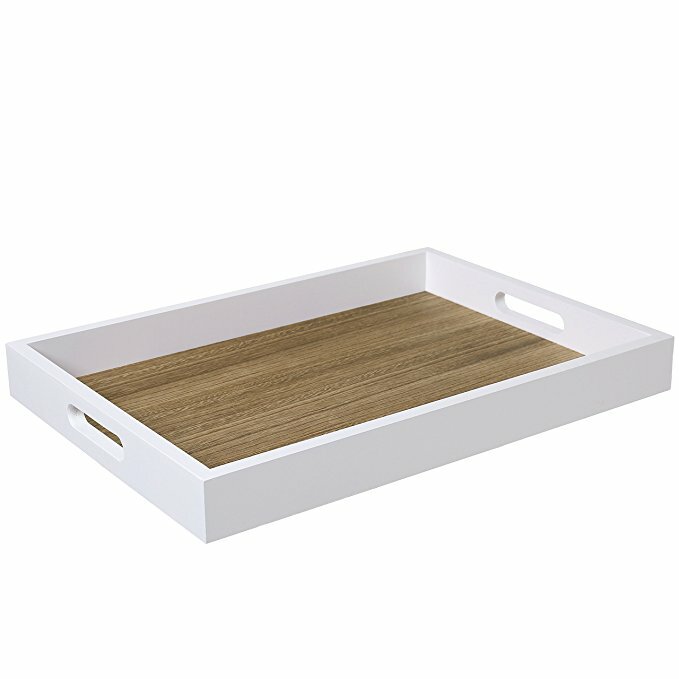 The tray features a minimalist, yet chic design, with natural wood for the base. It has two side cutout handles, which makes it super easy to transport from room to room, function to function. It also makes it convenient to use during a party or dinner; the raised edges and handles ensure that whatever you are serving will stay in its place. You can check out more specific measurement details and make the purchase.